Thanks to Burlington's ArtsRiot, the pop-up restaurant has become a daily occurrence. The only problem is, "daily" can quickly transmute into "everyday." Lately, I've come to take the idea for granted. But shake-ups are on the way. Beginning on April 7, Misery Loves Co. will return to its roots with a series of Monday night pop-up dinners. I kicked off the one-night-only dining season with a visit to the New England Culinary Institute. On March 21, the school's B.A. 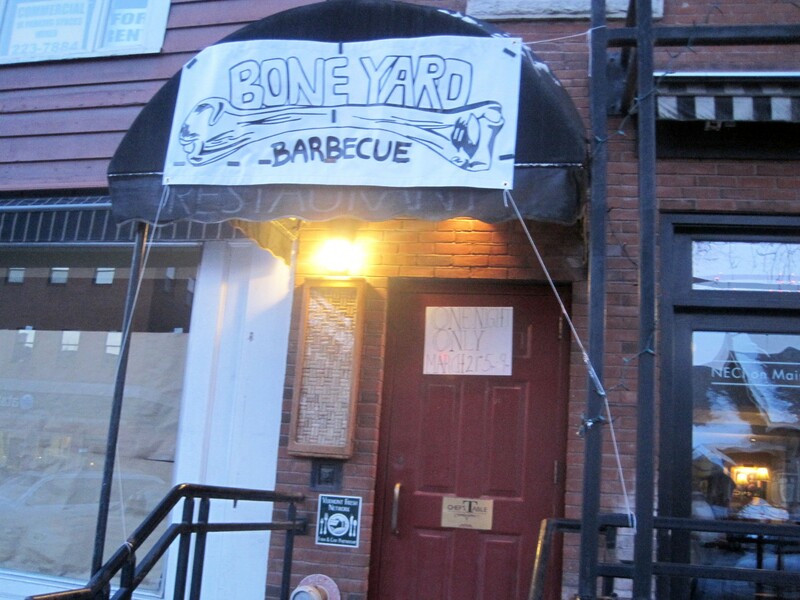 program students converted Main Street event space Chef's Table to Bone Yard Barbecue. Chef-instructor Jeffrey Andre told me that the barbecue theme was the students' choice. They identified a hole in the Montpelier marketplace and decided to fill it, if only for a few hours. The school project came to fruition in one night, but all the bases were covered, from country-ish checkered tablecloths to off-menu sweet tea made to match the fare. There were some kinks. Our server seemed too nervous to refill my water glass without a reminder, for example, but the dinner was intended as much a learning experience as something for diners to enjoy. Before we ordered, our student server asked whether we wanted bread. Hell, yeah, we wanted bread, especially when it turned out the students had prepared three different kinds. 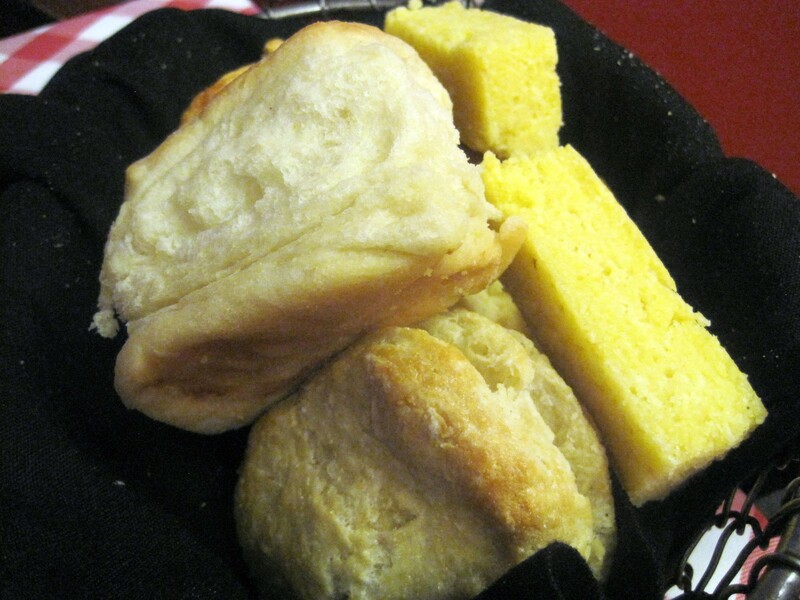 I was most fond of the flaky, chewy biscuits. My dining partner and I prided ourselves on eating just one apiece. 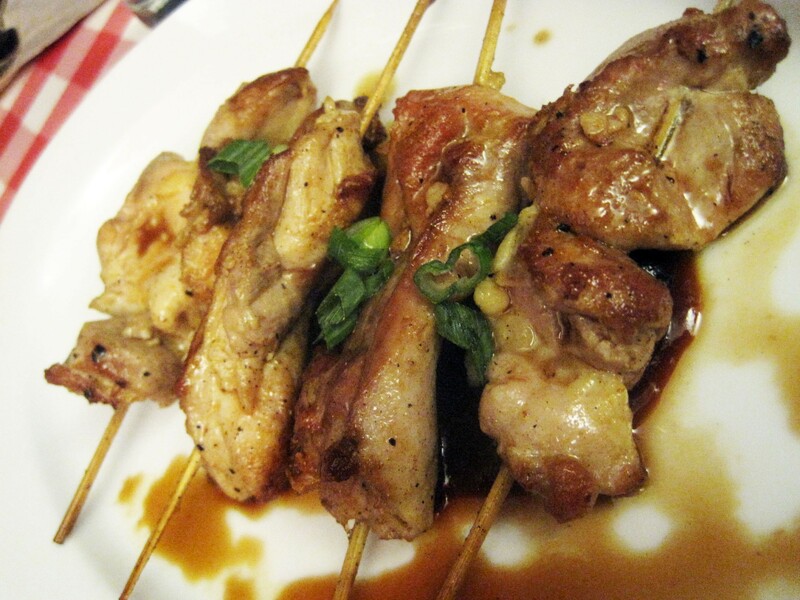 Seeking diversity in their menu, the students hit one of my favorite types of barbecue: yakitori. There were no beaks or tendons, but the choice of thigh meat was a better one than potentially dry breast. It was a bummer that the boneless chicken was left with frills of yellow fat untrimmed, especially since the meat was broiled to a wonderfully juicy crispness. The garlicky sauce wasn't what I would expect from a real yakitori bar, but I still soaked up much of it with my biscuit. I'm unlikely to have a chance to repeat that combination. 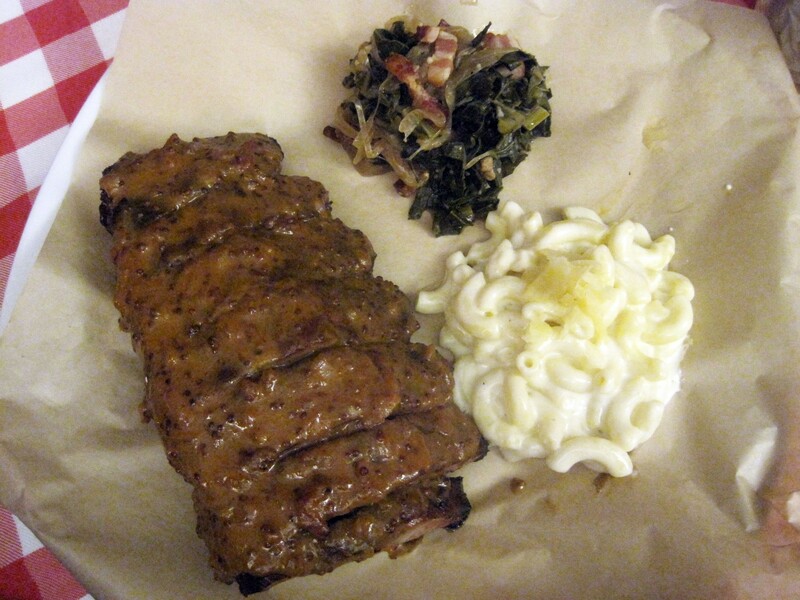 At every table I saw, diners had ordered at least one plate of ribs and quickly devoured them. I was delighted to see that, despite it being cooked in vast quantities, the smoky pork clung to the bone until my teeth easily stripped it away. However, I fixed a Barbecue 101 mistake myself: The trainee chefs had left silver skin on the bottom of the bones — no problem to strip away with a single swipe. I ordered my ribs dressed in mustard sauce because it was the only one listed as non-vegetarian. The bacon-fat flavor and tangy mustard made for an enjoyable balance. But I was more impressed with the side of earthy coffee barbecue sauce. Thoroughly caramelized onions sweetened up the supple collard greens. But big chunks of bacon proved to be the star of that side dish. The Mornay base of the mac-and-cheese would have benefited from more fromage, but this was a comforting eat nonetheless. Because of the small issue I encountered with the ribs, I was even more impressed with the preparation of the brisket. The fine-dining-style plating reflected the care that went into the meat. The buttery-tender brisket had been been trimmed of every sliver of excess fat, leaving an unexpectedly upscale bite of beef. However, the whiskey-molasses sauce was sticky-sweet without the burn of booze, and a seemingly acid-free slaw didn't help matters. 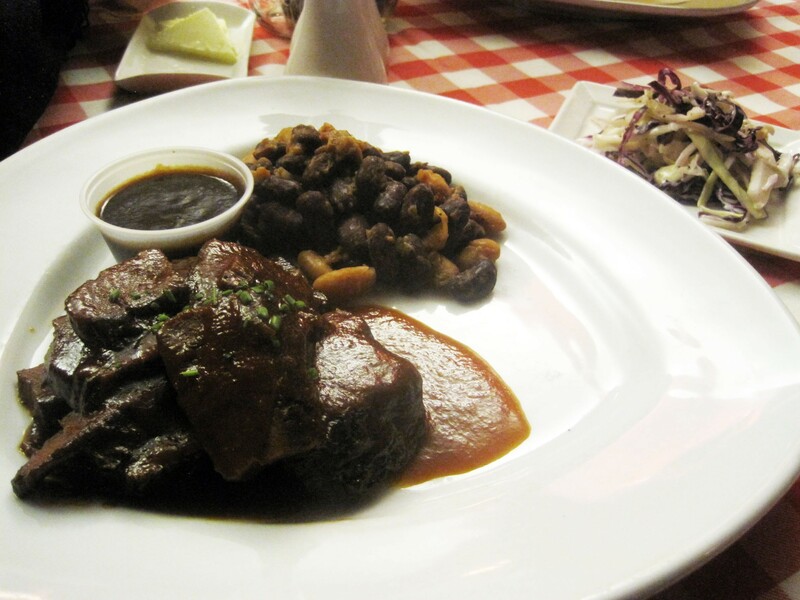 A pork-tastic side of beans was the best accompaniment of the night. My dining partner and I were divided on the apple crisp. The students made their own spice mix for the enjoyably crunchy dessert. 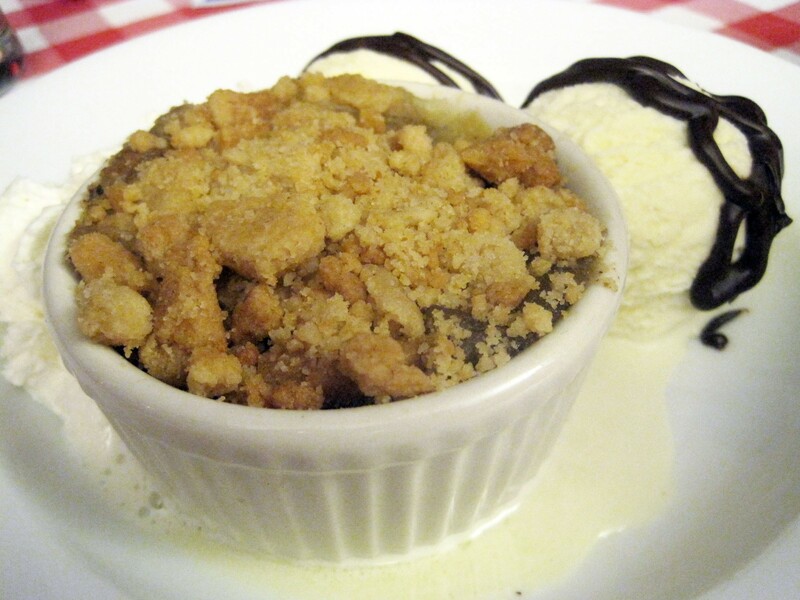 I was put off by its emphasis on star anise — it was like a licorice crumble. But my companion adored how the spice complemented the ice cream on the side. Along with vanilla and chocolate, the students had crafted an Old Fashioned ice cream, complete with Maker's Mark. Serious stuff, but not excessively boozy in flavor. The dish was covered in a few thick tendrils of hot fudge, and I wouldn't be surprised if it became a menu staple if Bone Yard ever took off for real. And who knows? It wouldn't be the first pop-up that grew into a real, live restaurant.